Music is an integral part of the majority of religious traditions throughout the world. This LibGuide focuses primarily on the Christian tradition but throughout the various resources presented other faiths are represented as well. This LibGuide provides links to Databases, websites, academic journals, and references sources. These are just some of the many resources available through the DTL. Please use the search bar above and the A-Z list to find even more resources for your studies. This collection delivers the sounds of all regions from every continent. The database will contain important genres such as reggae, worldbeat, neo-traditional, world fusion, Balkanic jazz, African film, Bollywood, Arab swing and jazz, and other genres such as traditional music - Indian classical, fado, flamenco, klezmer, zydeco, gospel, gagaku, and more. It contains over 10,000 songs. This site provides access to thousands of music performances which have download free with violating copyrights. Many of the songs can be adapted for reuse (the terms of reuse are explained on the website). Digitized collection of over 47,000 musical works in public domain (free for use and reuse). This initiative aims to become the world's most comprehensive open network of digital resources for the study of music. Curated by a community of music scholars, students, teachers, and librarians, the Open Music Library is a free discovery service, offerings hybrid access (free and paid) to peer-reviewed journal articles, books, and scores from the world's digital collections. The Church Music Association of America (founded in 1874) is an association of Catholic musicians and others who have a special interest in music and liturgy, active in advancing Gregorian chant, Renaissance polyphony, and other forms of sacred music, including new composition, for liturgical use. The CMAA’s purpose is the advancement of musica sacra in keeping with the norms established by competent ecclesiastical authority. Contains free access to hundreds of resources concerning sacred music. Do you search for hymns and worship music for worship services? Are you researching a particular hymn? Looking for an arrangement or media file? If so, Hymnary.org is for you. Hymnary.org is an online hymn and worship music database for worship leaders, hymnologists, and amateur hymn lovers alike. At Hymnary.org you can search or browse hymns by title, tune, meter, key, scripture reference, and more. In partnership with The Hymn Society in the United States and Canada, Hymnary.org now houses the Dictionary of North American Hymnology -- making Hymnary.org the most complete database of North American hymnody on the planet. a database of more than 17,000 books, articles, facsimiles, dissertations, and papers read at recognized conferences and meetings. Site maintained by Yo Tomita. A research database and portal to digital resources on the composer. A joint project of the Ira F. Brilliant Center for Beethoven Studies and the American Beethoven Society, the Beethoven Gateway is available 24/7, free of charge to anyone with access to the internet. BMS includes monographs, articles and reviews from journals, Festschriften, congress proceedings, yearbooks, anthologies and essays from critical reports. Main sources for the BMS editorial staff are national bibliographies, journals, monographs and subject bibliographies. Furthermore, contributions from journals with an interdiscplinary view on music are considered for inclusion. We annually check some 2,500 sources and add approximately 10,000 articles and reviews. Bibliographic records are often amended by a summary. Our analog data from the period 1950-1975 are already revised and converted. BMS is continuously expanded. Here you can browse the titles of journals covered by BMS. The purpose of this web site operated by the Internationale Stiftung Mozarteum in cooperation with the Packard Humanities Institute is to make Wolfgang Amadeus Mozart's musical compositions widely and conveniently accessible to the public, for personal study and for educational and classroom use. The digitized version offers the musical text and the critical commentaries of the entire Neue Mozart-Ausgabe, edited by the Internationale Stiftung Mozart in cooperation with the Mozart cities of Augsburg, Salzburg, and Vienna. The Lester S. Levy Collection of Sheet Music consists of pieces of American popular music. This music was generously donated to The Johns Hopkins University by Lester S. Levy over a period of years starting in 1976 and is now housed in the Special Collections Division of the Milton S. Eisenhower Library. The collection spans the years 1780 to 1980, but its strength is its thorough documentation of nineteenth-century America through popular music. The collection is especially strong in music spawned by military conflicts. From the War of 1812 through World War I, and minstrel music is also well represented. Other topics include music about the circus; dance; drinking, temperance, and smoking; fraternal orders; presidents; romantic and sentimental songs; schools and colleges; and transportation. The sheet music in this digital collection has been selected from the Sheet Music Collection at the John Hay Library at Brown University. The full collection consists of approximately 500,000 items, of which perhaps 250,000 are currently available for use. It is one of the largest collections of sheet music in any library in the United States. The sheet music, primarily vocal music of American imprint, dates from the 18th century to the present day, with the largest concentration of titles in the period 1840-1950. RISM is an international, non-profit organization with the aim of comprehensively documenting extant musical sources anywhere in the world. RISM's database offers the most comprehensive documentation available for music manuscripts and printed music for the time between 1600 and 1800. It continues to grow through monthly updates. This database contains recordings (audio and some) of over 100,000 live concerts from thousands of major groups. Sacred Music is the official journal of the Church Music Association of America, and the oldest continuously published journal of music in North America. It is the essential resource for every Church musician, professional or amateur, who is interested in the restoration of the sacred in Catholic liturgical life. 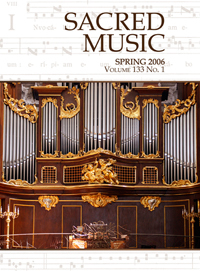 The Yale Journal of Music & Religion (YJMR) is published twice yearly by the Yale Institute of Sacred Music, an interdisciplinary graduate center that educates leaders who foster, explore, and study engagement with the sacred through music, worship, and the arts in Christian communities, diverse religious traditions, and public life. "The official publication of the American Choral Directors Association is Choral Journal. This national publication, issued monthly, contains articles and columns of a scholarly and practical nature in addition to reviews of newly released CD recordings, books, and printed music." "Early Music is a stimulating and richly illustrated journal that is unrivalled in its field. Founded in 1973, it remains the journal for anyone interested in early music and how it is being interpreted today. Contributions from scholars and performers of international standing explore every aspect of earlier musical repertoires, present vital new evidence for our understanding of the music of the past, and tackle controversial issues of performance practice. Each issue contains a wide range of thought-provoking articles on performance practice. New discoveries of musical sources, instruments, and documentation are regularly featured, and innovatory approaches to research and performance are explored, often in collections of themed articles." "THE HYMN is a peer-reviewed journal of congregational song for church musicians, clergy, scholars, poets, and others with varied backgrounds and interests. A journal of research and opinion, containing practical and scholarly articles, THE HYMN reflects diverse cultural and theological identities, and also provides exemplary hymn texts and tunes in various styles." "Das Jahrbuch für Liturgik und Hymnologie (JLH) wird von Jörg Neijenhuis, Daniela Wissemann-Garbe, Alexander Deeg, Michael Meyer-Blanck, Irmgard Scheitler, Matthias Schneider und Helmut Schwier in Verbindung mit der Internationalen Arbeitsgemeinschaft für Hymnologie und dem Interdisziplinären Arbeitskreis Gesangbuchforschung Mainz, dem Liturgiewissenschaftlichen Institut Leipzig und der Liturgischen Konferenz herausgegeben. 1955 wurde es von Konrad Ameln, Christhard Mahrenholz und Karl Ferdinand Müller begründet." An online magazine dealing with news concerning contemporary Christian music. 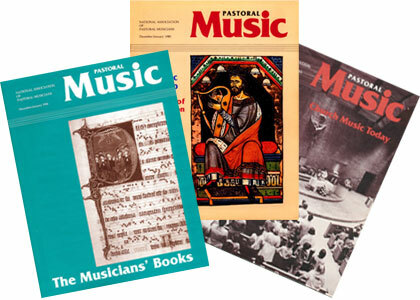 Official Magazine of the National Association of Pastoral Musicians. "It was natural, therefore, in the ordinary course of events, that someone should come forward and try to bring within the limits of a book of reference the enormous mass of facts which surround our national hymnology. It is impossible to give too much credit to the Rev. John Julian for his courage in facing such a task, or too much praise for the admirable manner in which he has fulfilled it. The result of his labours is a volume of 1,6oo pages, closely printed, abounding with facts of the greatest interest. People talk of the romance of hymn tunes and their composers, but the romance of hymns and their authors is not a whit the less thrilling and fascinating.” - Musical Times and Singing Class Circular"
Sacred Music LibGuide by Christopher Crawford is licensed under a Creative Commons Attribution-NonCommercial-NoDerivatives 4.0 International License.